All these roles existed in SharePoint before, but had to be configured manually by starting and stopping the correct associated services. With SharePoint Server 2016 Feature Pack 1, this feature has been enhanced to support small and medium sized farms. 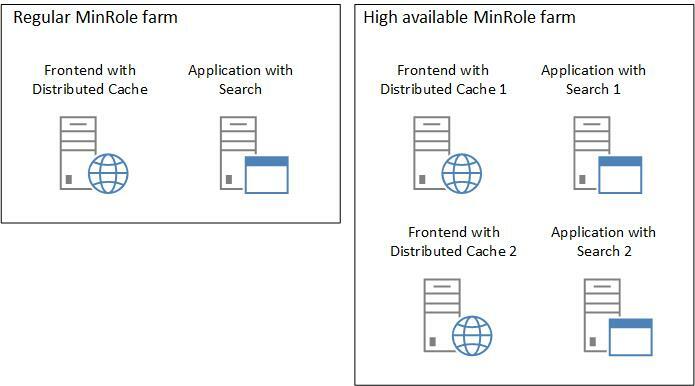 The shared MinRole concept enables the combination of server roles in the form of “Application with Search” and “Frontend with Distributed Cache” and is also available in SharePoint Server 2019. This shared MinRole requires only 2 servers for a regular farm and 4 servers for a high available farm. The following screenshot shows the role conversion dialog of SharePoint Server 2019. The dedicated MinRoles are still available, plus the enhanced MinRoles, plus the roles Custom and Single Server Farm. The Custom role enables the farm administrator to configure the roles and associated services free from MinRole regulations, as it was before in SharePoint Server 2013. The single server farm contains all roles and services on one server. The speciality here is that a single server farm can not be extended with additional servers. Before doing this, it has to be converted in one of the other server roles. This choice of server roles makes it possible to realise every imaginable farm sizing with SharePoint Server 2016 and 2019 to fit the special customer needs by combining exactly the roles and services that are needed in this special environment and usage scenario.